Patients today still have a hard time finding affordable, high-quality care without long wait times — a detrimental symptom of a bloated and unreliable healthcare system that affects billions around the world. 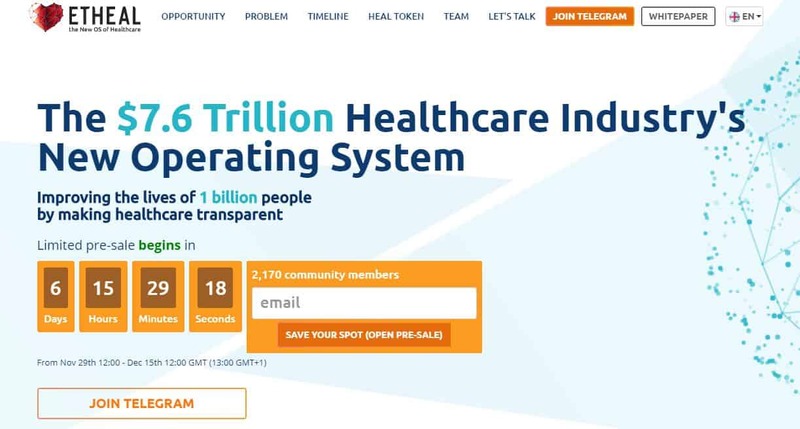 But with powerful tools like the blockchain and cryptocurrency, and advisors including an Ethereum genesis block miner, Etheal is tackling this issue with a transparent, blockchain-based global list of peer-reviewed health professionals. The Etheal team’s goal is to enable patients who are travelling or who have limited personal contacts due to a busy lifestyle or remote location, to quickly access specialised treatment. The Etheal ecosystem combines blockchain technology and its own dedicated HEAL utility tokens to incentivise patients to review health professionals in an automated, smart contract driven system. Doctors and specialists can then easily maintain an online reputation by embedding these reviews, which are stored on the blockchain. The team also plans to set up a rewards system for patients and care providers to power future apps that can drastically reduce research and communications overhead, like a self-service tool for pharmaceutical companies that facilitates access to victims of rare diseases in remote areas. The concept of Etheal grew out of the team’s previous startup, Doklist.com and Doklist.br, a thriving healthcare comparison site serving more than 2.5M visitors per year in Hungary and Brazil. The rise of ICOs and popularisation of blockchain and cryptocurrencies has provided the technological catalyst needed for Doklist.com to evolve into a completely decentralised ecosystem with the capacity to serve billions around the world. Current major competitors include ZocDoc and Docplanner, general healthcare comparison sites that list between 30 to 1,000 general medical services compared to Doklist.com’s 88,000 specialties and procedures — a huge jump in data built with Natural Language Processing. Etheal’s competitors also rely on patients to volunteer time to write a review without providing active incentives, a pitfall that Etheal addresses with a dedicated Weekly Contribution Endowment Fund rewarding patients who write useful reviews. The subsequent content is then stored on the blockchain, so that doctors aren’t reliant on paying and managing their profile on a single platform to uphold their online reputation. “Most of our competitors are really focused on the technology behind their platforms instead of optimizing their UX for real use cases experienced by both health care providers and patients. Our focus was always on providing an effective solution for as many scenarios as possible from the get-go, to really make a positive effect on people’s lives,” explained Dr. Mihaly Kertesz, Co-founder and COO of Etheal. This year saw ICOs and blockchain technology emerge in industries across the board to tackle huge flaws in major industries. ICOs now account for more of the funding of blockchain-based companies than all of venture capital, with a large majority of the nearly $2.3 billion raised to date taking place in the first half of 2017. What’s more, in a study conducted by the IBM Institute for Business Value, results showed that 16% of healthcare companies are ready to implement blockchain in 2017 for commercial purposes. The successful traction and growth of Doklist.com — and the simultaneous 223M and 50M raised in venture capital by ZocDoc and Docplanner respectively, is a strong indicator of the urgent need that Etheal meets with a scalable solution capable of serving the $7.6 trillion healthcare industry. “The beauty behind the Etheal ecosystem is its infinite potential to scale into various healthcare sectors — we are already thinking about Etheal Platform Applications, including a Medical Tourism App, a free AI-driven chatbot to manage online profiles of health professionals, a Healthcare Fundraising Platform,” says Kertesz. The Etheal team is no stranger to the world of healthcare, marketing or cryptocurrency, boasting an alumnus physiology professor from Harvard Medical School, Google, Bank of America Merrill Lynch, and McKinsey professionals, and a miner of the Ethereum genesis block among its ranks. “Making healthcare more transparent is important and deeply meaningful, and with the HEAL utility token, the Etheal core team has a powerful vision of improving the lives of 1 billion people,” said Etheal advisor Barnabas Debreczeni, founder of MrCoin.eu, on why he chose to join Etheal after four years in cryptocurrency entrepreneurship. Etheal’s token pre-sale goes live this November and can be accessed on Etheal.com.